While listening to voice mails at work yesterday, I did a quick, incomplete, sketch of my plates and came up with 18 plates I try to keep spinning … just at work. I’m definitely not an artist, but I am visual … seeing those plates drawn was eye-opening to me. When I get tense, I notice myself sort of holding my breath &/or taking shallow breaths. Well, actually what I notice is the sudden need to take a deep breath. Whew. Amazing how much better it feels to breathe deeply! What am I doing to myself!? I decided to schedule a physical with my doctor. I am also scheduled to take my freckles to visit a dermatologist. Good girl, right? Well, here’s the deal. I figure that the more doctors you see, the more tests they order, the more likely they will find something that is wrong with ya. I know. I know. That is not the way I should look at it. I’ll trot off obediently and hope they don’t recommend a psychiatrist. Good gravy – I know a psychiatrist would have a hey-day with me. This entry was posted in Friends and Family, Positive Thinking, Work/Career and tagged doctors, family, freckles, friends, physicals, positive thinking, priorities, psychiatrists, smile!, Spinning plates, work and home. Bookmark the permalink. 2 Responses to Spinning, spinning … breathe! 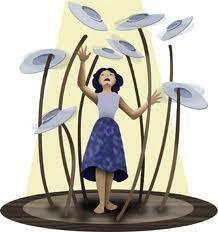 I understand about the spinning plates. Most of mine just sit on the floor. I don’t even bother trying to juggle some of them anymore. – too much broken crockery. Hope your doctors’ visits go well! I love your reply – you should blog about your plates sitting on the floor! Thank you, as always.